Japanese scientists are proposing various names for select areas on asteroid Itokawa. BOULDER, Colorado - Japan's Hayabusa space probe is poised to edge closer to asteroid Itokawa - a move that sets the stage for an historic attempt to sample and return a specimen to Earth from such an object. Images taken by the spacecraft of Itokawa are already puzzling scientists. If all goes as planned, along with sampling duties, Hayabusa will eject a tiny robot onto the space rock that hops about while relaying images direct from the asteroid. Japanese space scientists point out that a soil sample from an asteroid can yield clues about the raw materials that made up planets and asteroids in their formative years. Even the smallest of sample from the asteroid can be of huge scientific value. Hayabusa -- also termed the "MUSES-C" spacecraft -- rocketed from Kagoshima Space Center on May 9, 2003 and is a project of Japan's Institute of Space and Astronautical Science (ISAS), a Space Science Research Division arm of the Japan Aerospace Exploration Agency (JAXA). In the middle of September, Hayabusa came to a "still" encounter with asteroid Itokawa. The probe and rock move through space at the same pace. Now the spacecraft is being readied for a new suite of observations. And in November, the schedule calls for a dress-rehearsal of sampling the asteroid, following by two actual sampling encounters. Originally tagged as asteroid 1998SF36, the object was renamed Itokawa in 2003 by the International Astronomical Union (IAU) after the late Hideo Itokawa, deemed the father of space development in Japan. With Hayabusa starting its survey of the asteroid, project team members have proposed names for the major features on Itokawa. Under guidelines of the IAU, terrain larger than about 330 feet (100 meters) shall have the names of gods, internationally well known places with their significance requiring approval. Muses Sea: Smooth terrain and stands for MUSES-C, the project code of Hayabusa, and named after the expanse where the Greek goddesses Muses dwell. Uchinoura Bay: A possible crater on Itokawa, named after the spaceport site of Kyushu Island, Japan from which the probe lifted off. Woomera Desert: A possible large crater on Itokawa, named after the intended recovery area of Hayabusa's sample return capsule - the Woomera Prohibited Area in Australia and the "return port" of Hayabusa. 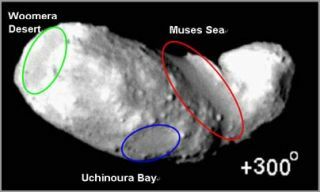 Hayabusa has been busy imaging and collecting spectral data of asteroid Itokawa, doing so from its so-called "Gate Position" - just within 12 miles (20 kilometers) of the space stone. The spacecraft is soon to move into the "Home Position" - just 4.3 miles (7 kilometers) distance, said Donald Yeomans, a senior research scientist and asteroid expert at the Jet Propulsion Laboratory (JPL) in Pasadena, California. Yeomans said the images from Hayabusa have already revealed a few surprises. "There are smooth regions and areas where several sizable surface chunks and boulders reside. Normally, one would expect these boulders to be caused by impacts but surprisingly, there are no obvious impact craters," Yeomans told SPACE.com. "As is usually the case with successful small-body missions, there is a whole new set of questions to answer." At least two surface samplings are scheduled for the second half of November, Yeomans noted, "and it will be difficult for the science team to decide which of the many interesting regions on this small, but diverse, asteroid should be sampled." Having Hayabusa bring back the goods from asteroid Itokawa adds to the international hunger for hauling back to Earth bits and pieces from the great beyond. For example, NASA's Stardust spacecraft is en route to deliver the first cometary dust samples to an anxious group of waiting scientists in January of next year, Yeomans noted. "And the Hayabusa spacecraft will deliver the first asteroid samples to an equally anxious group of scientists in June 2007. This really is the golden age of small body exploration." Hayabusa's moving in on Itokawa for sampling duties is tricky. It is not possible to land and stay put on an asteroid with very low gravity. So Hayabusa's contact with the rocky world lasts only one second. But during that brief encounter, the probe will fire a tiny metal ball at high-velocity toward the asteroid's surface. The projectile breaks the surface and the bits and pieces of the asteroid generated by the hit is guided through the craft's sampler horn to a sample catcher inside. The catcher is pushed into the recovery capsule. The equipment is designed to cope with basalt to sand materials. A mini-robot nicknamed Minerva will detach from Hayabusa and land on Itokawa. The ultra-small 1.3 pound (591 grams) hardware will survey its surroundings while moving about the asteroid's surface. Minerva travels by leaping, using its own momentum by accelerating a weight inside itself. Onboard Minerva is a camera and a sensor to take images of Itokawa's surface and also read its temperature. Clark Chapman, a space scientist and expert in asteroids here at the Southwest Research Institute, said he was very excited about the potential of Hayabusa. "The surface hopper -- a cheap off-the-shelf replacement for a cancelled American contribution to the mission -- could tell us a lot about the surface properties of a low-gravity object," Chapman told SPACE.com. The returned sample material from an asteroid, a task not ever done before, is bound to hold surprises, or perhaps confirmations, Chapman advised. "We have many meteorites, but we've never known where they come from," he said. Already, the images transmitted back from Hayabusa are of scientific benefit. The imagery so far confirms the general predictions for shape of this asteroid based on Earth-based observations, Chapman noted, "but it also shows features that are very intriguing and interesting." Those features include large smooth areas, much more prominent than the surprising smooth areas seen on asteroid Eros by NASA's Near Earth Asteroid Rendezvous (NEAR) Shoemaker probe during a yearlong, close-up survey, followed by a landing on that space rock on February 12, 2001. Furthermore, Clark said, Japan's Hayabusa is observing interesting "bumps" that may turn out to be mountains or boulders. "This is shaping up to be a fascinating space mission," he concluded. "The Hayabusa mission has it all," said Lucy McFadden of the astronomy department at the University of Maryland in College Park, Maryland. She is also a member of the NASA Deep Impact spacecraft science team that had an on-purpose "run in" with comet Tempel 1 last July. Hayabusa is a remote sensing mission, a lander and a sample return. "Taken all together," McFadden added, "this is going to be a great advance in our knowledge of asteroids." Data gleaned by Hayabusa will be compared with what is known about NEAR's look at asteroid Eros, as well as observations by that same craft of asteroid 253 Mathilde, she said. What's more, all this data will be mixed in with what comes from surveys of asteroids Vesta and Ceres courtesy of the NASA Dawn mission. That probe is set for launch in the summer of 2006, McFadden explained. Once its sampling is finished, Hayabusa becomes a "hit and run" probe, departing the asteroid scene in early December. Trekking back to its home planet, the space probe is to eject its return capsule at a distance from Earth equal to half the distance to the Moon. That capsule then fireballs its way through Earth's atmosphere in June 2007, headed for a parachute deployment and landing in the desert of Woomera, Australia.